Nasal obstruction is the most common complaint among patients presenting to otolaryngologists which disturbs the quality of life of the patient. The anterior end of inferior turbinate is in the narrowest part of nasal airway, enlargement of which causes significant nasal obstruction. 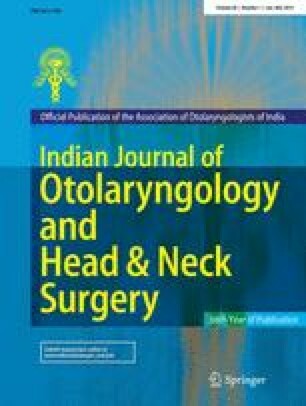 In our, prospective and interventional, study a comparison was made between the results of bipolar radiofrequency assisted turbinoplasty and microdebrider assisted turbinoplasty in patients with chronic nasal obstruction due to inferior turbinate hypertrophy, not responding to medical treatments. The cases were randomly divided into radiofrequency (RF) and microdebrider (MD) groups, each consisting of 30 cases. Nasal obstruction, sneezing, itching in nose, rhinorrhea, intra operative bleeding, duration of surgery, post operative bleeding, post operative pain and crusting were the parameters recorded preoperative, intra operative and post operatively at 1 week, 1, 3 and 6 months. For bleeding and crusting standard 4-point scale was used. Rest of the symptoms were assessed subjectively on standard visual analogue scale (0–10). The statistical analysis was done by student’s t test. Postoperatively, all the preoperative symptoms were significantly improved up to 6 months in group RF as well as group MD, but there were three cases of recurrence at 6th months of postoperative period in group RF. However, we recommend MD assisted inferior turbinoplasty under local anaesthesia in view of long term symptom relief and lesser recurrence.